"Houndsley, the dog, and Catina, the cat, are an unlikely pair, but they enjoy each other's company-most of the time. In this episode by James Howe, told in three short chapters, Houndsley is secretly annoyed with Catina because her constant chatter disrupts the peace and quiet of their canoe trip. On the other hand, Catina loves to ride her bicycle and she can't understand why Houndsley doesn't. Later, Catina learns that her friend doesn't know how to ride a bike, and helps him learn. Houndsley finds out what his feline pal's incessant babbling was due to her fear of water, and he eases her concern by teaching her how to swim. The next time they go canoeing, Catina-now a master dog paddler-is as quiet as can be. Marie-Louise Gay's soft, translucent watercolor-and-pencil illustrations enhance the text. Peter Pamela Rose's well-paced narration is soothing and musical, and she creates a distinct voice to reflect each character's personality. Some of the more carton-like voices may grate on adult ears, but most kids will enjoy the animated performance. Quiet background music and ambient noises (seagulls calling, water splashing) add aural interest. Page-turn signals are optional. A solid choice for beginning readers." "As the two friends Houndsley and Catina delve into canoeing, biking, and swimming, something seems to be hindering their friendship. 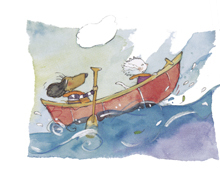 Houndsley doesn't care for Catina's constant chatter in the canoe, and Catina wonders why she's never had Houndsley's companionship while biking. How do you say no to a friend or let a friend know that you're nervous? With the help of two more friends, Bert and Mimi, things start to change. Peter Pamela Rose enthusiastically characterizes the animal friends. She delivers a deep, slow voice for Houndsley and a high-pitched, animated one for Catina. Rose's enunciation is precise, and she narrates at a deliberate pace that is perfect for young listeners."